Slow Food potluck at the Chilmark Community Center. Bring a dish for 6 and your own place-settings (it's a Zero-Waste event). or let someone else do it . . .
Tuesday, Dec. 10 at 6:00 pm, O.B. Island Grown Schools and the MV Regional High School Culinary Arts program present a Harvest Feast prepared by students and chef Austin Racine. At the high school, $30 adults, $15 students. The Cape Light Compact presents tips for saving energy and money. At the O.B. Library, call (508) 693-9433 for more info. A simple method for turning leftover turkey into a versatile filling for tacos, enchiladas and burritos, but also (for when everyone has had one-too-many gobbler sandwiches) a passable facsimile of pulled-pork barbeque, with a Tex-Mex twist. The key to this method is patience. Gently simmer all ingredients in water (or, better, turkey broth) in a covered pot or slow-cooker until it pulls apart easily with a fork. Use just enough liquid to almost cover the meat. When done, briefly simmer uncovered if there is excess liquid. Serve with warm tortillas and fresh vegetables. Shredded cabbage is a good substitute for lettuce here. Also, while the meat is stewing, try marinating thinly sliced red onions in orange juice. They will lose most of their sharpness but retain the crunch. So while the Almanac will always be free, much of what we do carries significant financial costs. If you’re not already a member, please consider joining today. 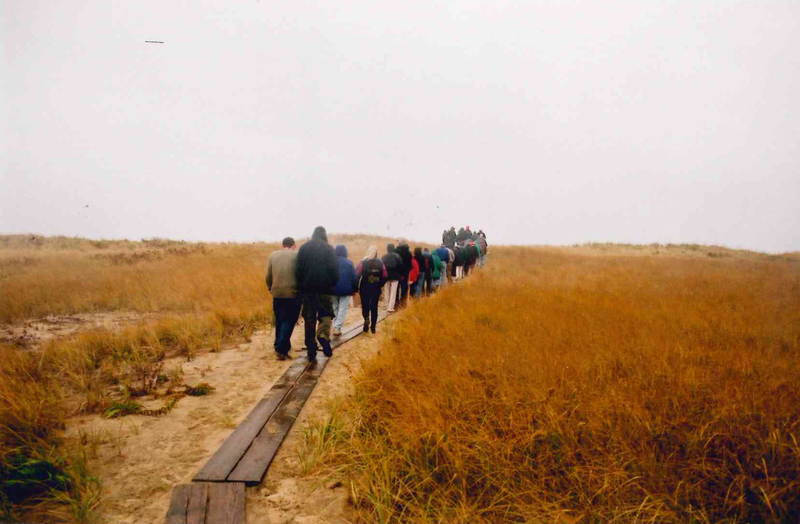 This winter's “Living at Sea Level” walks series continues Sunday, December 8th starting at 1:00 pm. Naturalist Susan Whiting and VCS staffer Jeremy Houser will co-lead a walk originating at the Quenames farmhouse that has been occupied by the Whiting family for more than 200 years. Walkers will observe changes in the landscape since the days of grazing, and discuss anticipated impacts of climate change, such as sea level rise and increased storm intensity. The route will include Quenames Cove, Little Black Point and Black Point Pond, and, if time allows, the beach to Crab Creek and Tisbury Great Pond. Participants should dress appropriately and be prepared for two hours of activity. Bring binoculars! Cider and cookies served afterward. The VCS educational walks are free and open to the public, but due to limited space carpooling is suggested and RSVP is requested. Directions: From Alley’s General Store go 1.9 miles west to Blue Barque Road (on your left.) Take Blue Barque Road for approximately 1 mile, following VCS signs. When you come to the split rail fence take a left, then the first right. Sustainable seafood shopping today presents a balancing act. National Geographic has a useful web tool for visualizing the increasingly challenging business of making sustainable choices in eating seafood. With all of the variables that one might be (rightly) concerned about – mercury content, the sustainability of the fishery, the role of the animal in its ecosystem, etc. – it can difficult to weigh them simultaneously, or even identify anything that makes the grade. But playing around with the “Seafood Filters” on the tool helps isolate which concerns are most important. It also reveals some tradeoffs: if you set the sustainability slider to “good” or higher, you won’t find much that is both high in Omega 3 fatty acids and low in mercury; however, dropping the Omega 3s from the equation opens up a pretty diverse menu. The information behind this web tool is derived from the highly-regarded Monterey Bay Aquarium Seafood Watch guide.